Briefly checked user Mixture's alternative suggestions (http://www.portablefreeware.com/?id=199#comment26017). FYI, Veracrypt resides at http://veracrypt.codeplex.com/. incompatible with the GPL and ... if you submit code with this license, your code can then be taken into a proprietary black hole by someone else. Still, it's better than the TrueCrypt license (at least OSI-accepted) assuming their license allows for forks like this, which I guess Haller was calling into question above. Well, based on the article you linked, Ms-PL is not bad at all. According to the Free Software Foundation "it has a copyleft that is not strong, but incompatible with the GNU GPL". GPL incompatibility is not a big problem: it mostly means that no one can create a GPL fork of VeraCrypt. See also https://tldrlegal.com/license/microsoft ... 28ms-pl%29. You're absolutely right that you are free to do whatever you want to do with the code. However, in practice I think this ends up being less free. Some developers are bothered for example by the idea that what they're working on could get snapped up by some company who would add the marginal necessary features/polish and then sell it. This certainly happened with Microsoft who used the BSD networking stack and at least to some extent from Apple with Darwin. It might also explain the success of Linux over the many flavors of *BSD. Some users are bothered by the fact that a company can take an open protocol or system, go commercial with it to adopt and improve it in a closed way, and then dump it later (the embrace, extend, extinguish strategy). More critically, I want a security program's code to remain open so that we can have audits like the one that was run on TrueCrypt. The GPL a better license to encourage that type of analysis and ongoing scrutiny because the community is less afraid that it's going to get yanked into something commercial. All that aside, we're not doing great in the security realm right now so if a great program comes out, I'll definitely use it regardless of my hesitations about the license. It's up to the developer if he/she wants to allow it. Not every company that uses open source is evil. More about it below. webfork wrote: More critically, I want a security program's code to remain open so that we can have audits like the one that was run on TrueCrypt. The GPL a better license to encourage that type of analysis and ongoing scrutiny because the community is less afraid that it's going to get yanked into something commercial. Even if a company creates a closed-source fork of a security program, that doesn't automatically mean that the original open source project dies. They can coexist, or the closed-source project can die (e.g. if it's payware and no one is willing to pay). Myself I'm on the other side of the fence: I develop commercial software. We use some open source libraries such as Box2D. Of course we respect licenses and don't use GPL code at all. We have no intention of killing Box2D or any other library we use. After all, we benefit from upstream improvements. SYSTEM wrote: Even if a company creates a closed-source fork of a security program, that doesn't automatically mean that the original open source project dies. They can coexist, or the closed-source project can die (e.g. if it's payware and no one is willing to pay). No, it definitely doesn't imply an automatic death. No question there. SYSTEM wrote: We have no intention of killing Box2D or any other library we use. After all, we benefit from upstream improvements. This is kind of a GPL vs. BSD argument in a bottle. The BSD crowd counts on openness being in everyone's best interests, whereas the GPL crowd is concerned about their work going into some company's "new" format. Apple makes a ton of money selling the only power adapter that really works for Apple laptops. Quicktime is remarkably bad at playing any video format other than those created by Apple products. Google dumped the Open Document Format in favor of their own, developed their own browser even after they put quite a bit of time and money into Firefox. VeraCrypt v1.0e released (changelog and downloads at http://sourceforge.net/projects/veracrypt/files/). [url]http://veracrypt.codeplex.com/[/url] author wrote: UPDATE September 15th 2014 : VeraCrypt 1.0e is out with many security fixes and performance enhancements. [...] It supports MacOSX 10.6 and above and it requires OSXFUSE 2.3 and later (https://osxfuse.github.io/). MacFUSE compatibility layer must checked during OSXFUSE installation. Also a Linux version is available [...] Linux and MacOSX releases are signed with a PGP key. EDIT: it must be noted that for extensive coverage of the current TrueCrypt status (plus downright support -- and mirror), it's highly recommended to check security expert Steve Gibson dedicated page at http://www.grc.com/misc/truecrypt/truecrypt.htm. VeraCrypt v1.0f-1 released (changelog and download at http://veracrypt.codeplex.com/releases/view/565079). [url]http://veracrypt.codeplex.com/[/url] author wrote: Starting from version 1.0f, VeraCrypt can load TrueCrypt volume. It also offers the possibility to convert TrueCrypt containers and non-system partitions to VeraCrypt format. UPDATE January 5th 2014 : Support of the old TrueCrypt 6.0 has been included in VeraCrypt 1.0f-1, which is a minor update of VeraCrypt 1.0f. 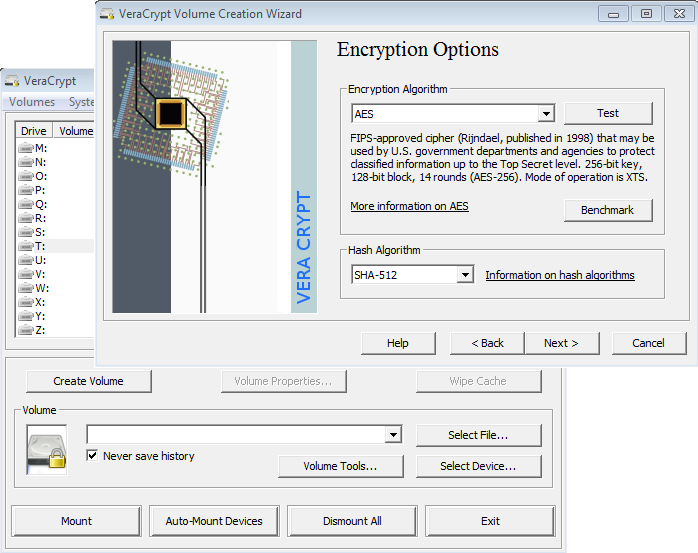 VeraCrypt is a free disk encryption software that is based on TrueCrypt. Merged. This needed to get split from the TrueCrypt thread anyhow. I made a few edits because I wanted to back off the notion of "immunity" to brute force and that the vulnerabilities are now "fixed". Hopefully that's the case but it might be a little soon to tell. Edit: switched the license over to Ms-Pl. Though I noticed the TL:DR legal site you listed. Very interesting site. Happily, the authors switched over to Apache 2.0. Updated entry and voted. I was unable to create an NTFS volume. Although the help file suggests this is a limitation of those without admin privileges, I don't have this problem on my machine. I'm not sure what's wrong and I am unwilling to use FAT for anything but data I don't care if I lose. Edit: this was caused by my volume being too small. A. ... what compression they used to figure out if there's a way to decompress it without executing self-extract code. It might even be listed in the forums. For the record, I don't think this is a serious concern with regard to Veracrypt's security. I think the EXE distro is more than adequate for analysis in VirusTotal, since that tool's reputation analysis isn't independent of the extracted contents. As a long time TrueCrypt user, I think there are much more pressing questions, specifically around whether VeraCrypt can reasonably secure computers in a very weird era of security.